A few weeks ago, before my life was consumed with correcting exams, processing grades and nailing down details for my upcoming wedding, we took a trip to Eskişehir. It is about an hour an a half on the fast train. The train was great. It ran frequently all day, was clean and convenient. The city itself is fun, but certainly a day trip—no need to stay overnight. We walked around all day and were able to see most of the city. 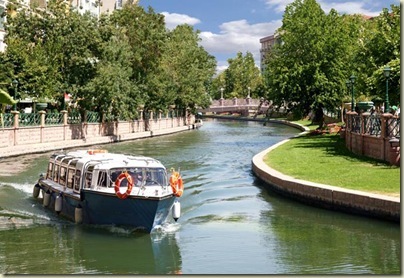 Eskişehir has a university and was considered to be a supporter of Ataturk as the city sacrificed itself during the Independence war, holding off the invasion of the British. The city was razed then later rebuilt. I was very surprised considering it liberal past, that there was such a conservative religious community. While religious people aren’t against Ataturk, and those who support Ataturk don’t deign religion, there tends to be a correlation between liberalism and Ataturk supporters. 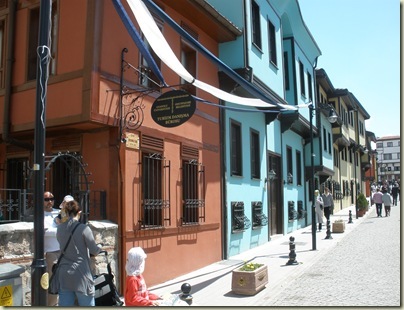 Most of the women I saw in Eskişehir wore headscarves, a few did not, but they were the minority. Though the closer we walked to the university the fewer “covered” women we saw. The first stop was the creek that runs through town. Now it is touristic and cute however, twenty years ago the creek apparently was rancid and stank and the cafes by the waterfront were ramshackle. The current mayor has done an enormous amount of renovations in town and it has made a huge difference. 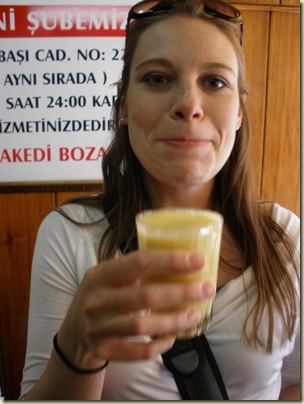 The next stop was boza, a fermented (nonalcoholic) wheat drink. It was slightly sweet, and very thick. You could eat it with a spoon. 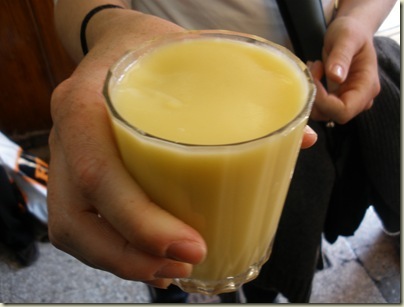 The shop sold only boza, and you could sprinkle cinnamon on top if you wished. It apparently has a lot of protein and vitamins and is healthy—though caloric. I was not nesaccarily a fan, though I could see the appeal. Later we went to visit the city’s real attraction. The restored Ottoman Style houses. 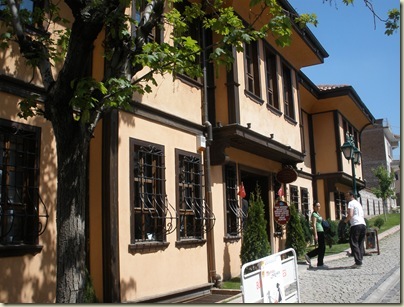 The Ottoman style houses have been preserved and restored. The neighborhood has turned into a tourist area with cafes and chai houses, though many locals still live in the houses, above the businesses. From Ankara it was a fun, inexpensive, quick day trip. The fast train takes only an hour an a half to reach the city. Everything in within walking distance from the train station so there is no need to tax about. The round trip train tickets are 32 liras for one person. It was a very lovely trip and a fun weekend activity. 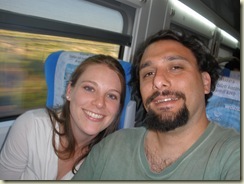 This entry was posted in Eskisehir, Train, Travel, Turkey and tagged Expat, Turkey by Jules. Bookmark the permalink. Hi Jules, It does look like we have a bit in common! How is Turkey treating you? I will have to read over your adventures more closely! Take care!